WatchOS 2 borrows liberally from Pebble's chronological data stream, but with some big differences in execution. Pebble couldn’t have been pleased with the smartwatch portion of Apple’s Worldwide Developers Conference keynote last week. Apple seemed to have taken a page straight out of Pebble’s playbook with an Apple Watch feature called Time Travel. 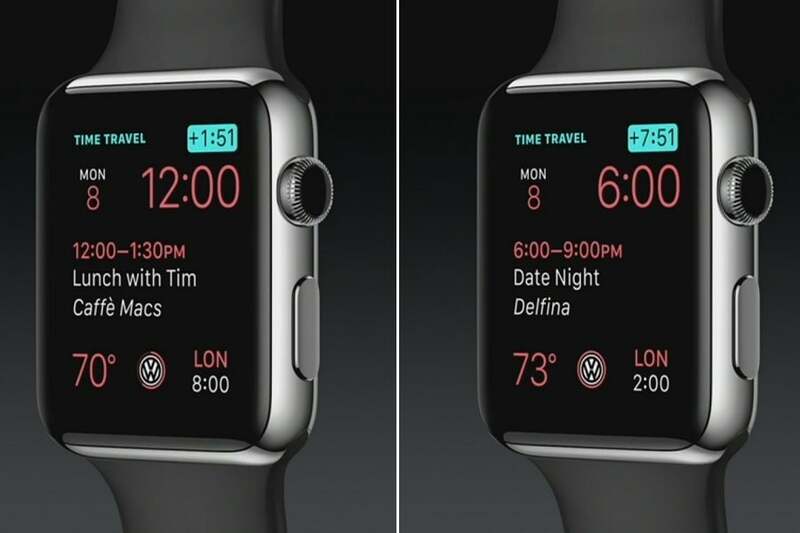 Coming this fall in watchOS 2, Time Travel will let users scroll the Watch’s Digital Crown to view information from the past or future, straight from their main watch face. A forward scroll, for instance, could show tomorrow’s weather forecast, and a backwards scroll could reveal the score of last night’s game. Months earlier, Pebble had revealed a similar feature called Timeline as part of its new Pebble Time smartwatch. By pressing up or down on the watch’s buttons, users can jump into the past or future to see relevant bits of information. 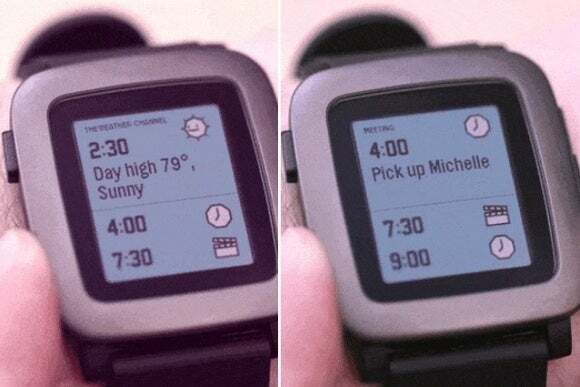 Pebble clearly saw Timeline as a crowning achievement in smartwatch software, with CEO Eric Migicovsky telling The Verge that it was unlike anything Apple or Google had come up with. “We’ve found a new framework to use as an interaction model on the watch,” he said in February. Coincidence or not, Apple has taken a liking to this interaction model as well. But is the Apple version of time-based information a pale imitation, a shameless rip-off, or a clever iteration? Upon closer inspection, it’s a combination of all three. Before we dive in, let’s back up and consider why Apple needed a feature like Time Travel in the first place. In my experience, the Apple Watch has been a beautiful piece of hardware with deeply flawed software. While the design is sharper than any other smartwatch on the market—even on the basic Apple Watch Sport I’ve been wearing for two weeks—watchOS can seem awfully dumb. Most reviews picked up on the obvious drawbacks, such as the confusing interface and the sluggish, non-native apps (the latter of which should also be addressed by watchOS 2). But my complaint is more fundamental: In regular use, I’m rarely compelled to do anything on the watch besides looking at notifications and checking the time. Everything else, from futzing with the app launcher to fiddling with Glances, feels like a waste of energy. I might as well just take out my phone. The missing ingredient is context. With smartwatches, I’ve taken to saying that if you see an app launcher, they blew it. Sure, picking an app from a list makes sense in a handful of situations, but most of the time, I want my smartwatch to figure things out for me. Using context, it should know what information I need, and understand when to serve it. That way, the watch not only saves time, but provides valuable insight into my day. It turns out that as a contextual tool, time is pretty important. It dominates so many aspects of our lives—time for the next appointment, time to water the plants, time to watch the game—that a smartwatch could become pretty clever just by organizing its information around time. With Pebble’s Timeline feature, future events are always just a tap away. That’s why Pebble’s Timeline and Apple’s Time Travel are such important features. Instead of just reminding us of important events through notifications, as our phones already do, these smartwatch features give us a quick high-level overview on demand. They’re much more powerful than notifications, yet faster than digging through apps or swiping through Glances. In other words, they’re a great interaction model for a smartwatch. Pebble’s Migicovsky was spot-on. 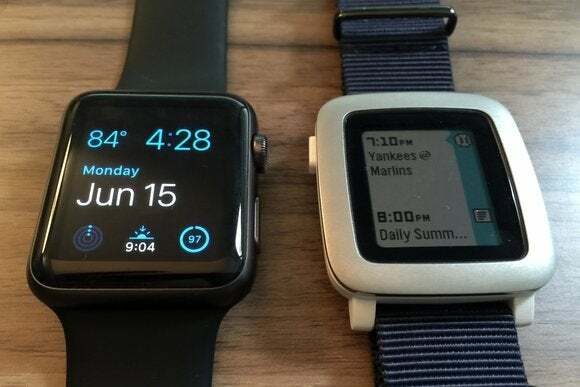 While Pebble and Apple seem to have created similar systems, in some ways they are very different. With Time Travel, Apple’s use of “complications” on the watch face could let users combine data points for better insights. Say, for instance, you have one complication for sports scores, and another for sports headlines. A quick scroll back in time might give you the score and a one-line recap. Apple’s watchOS 2 preview site gives an even simpler example: With calendar and weather complications, you could see the weather forecast for tomorrow’s meeting—just in case you’re thinking of having it outside. The robustness of Apple’s platform also makes a huge difference. Let’s say you wanted to read more of that game recap. A tap on the complication would let you dive into the app for a lengthier description, and from there you might even be able to send the story to your iPhone with Handoff. Want to reschedule your meeting based on the weather? A quick chat with Siri could help you get that done. While you can also launch apps from Pebble’s Timeline, they’re not nearly as capable. Combining multiple points of data could come in handy with Time Travel on the Apple Watch. The fact that Pebble’s Timeline is separate from the watch face is also beneficial, in a way that nicely suits Pebble Time’s always-on display. Right now, my Pebble Time review unit is rocking a picture of Mega Man on a blue background, and I wouldn’t have it any other way. With the Apple Watch, four out of 10 watch faces don’t support complications at all, and it looks like the upcoming Photo watch face won’t have complications either. Using any of these faces will mean missing out on Time Travel entirely. Beyond these conceptual distinctions, there are some differences of execution to consider, and here it’s hard not to see Apple as the victor. Right now, Pebble’s Timeline doesn’t have a lot of developer support—I count 21 apps that integrate with Timeline—and as a result it doesn’t feel like the game-changing feature that it could be. In fairness, it’s early days for the Pebble Time, but we can safely assume Apple is going to have less trouble getting developers on board. Even before launch, the Apple Watch accrued more than 1,000 apps—many from major brands that haven’t touched Pebble—and Time Travel gives them a chance to occupy prime real estate on users’ wrists. Apple’s hardware also lends itself to a time-based interface, with the ability to scroll through time instead of having to tap repeatedly on buttons. I don’t get much use out of the Digital Crown now—usually it’s easier to just swipe on the screen—but Time Travel could finally make this hardware flourish seem essential. That’s not to say Apple’s mimicry renders the Pebble Time obsolete. If you enjoy the original Pebble’s always-on display and multi-day battery life, the Pebble Time is a fine improvement. (My biggest complaints so far: The screen can look dim when it’s not in direct light, and the battery keeps falling short of the advertised week-long runtime.) I’ve ordered a Pebble Time Steel for myself, and don’t regret it. At the same time, I don’t fault Apple for running with Pebble’s signature software feature. This is how competition works, and now it’s on Pebble to make its brilliant idea even better. May the smartest watch win.